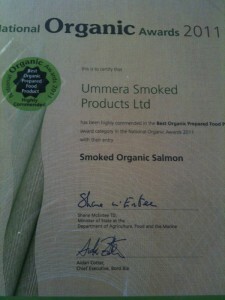 National Organic Awards – Ummera Highly Commended! 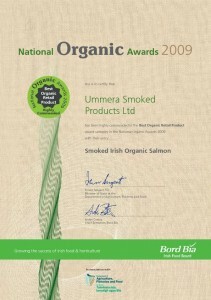 Last week we were invited to Dublin for lunch yesterday by Bord Bia to celebrate the National Organic Awards 2009. Unfortunately, we couldn’t make it so imagine our surprise (and delight) when we received a phone call from the Sunday Tribune congratulating us on our award! Ummera’s Smoked Organic Salmon had received a Highly Commended in the Best Organic Retail Product, coming second to Glenisk’s Organic Greek Style Natural Yoghurt. The independent judging panel chaired by Hugo Arnold, journalist and Food Consultant included Cian Doorley, Musgrave Retail Partners Ireland; Evan Doyle, Proprietor Brooklodge Wells and Spa; Darren Grant, Proprietor, The Organic Supermarket Blackrock, Co Dublin and Oliver Moore, journalist, researcher and organic blogger. What a week but ending in Gold! Back from 40 degrees in Spain on Monday afternoon to be welcomed by 36 hours continuous rain! Busy catching up on all that happened after ten days out of contact with the world; it’s an experience doing without all the mod cons of today’s world, but is a great relief to know that emails, mobiles, blogs, and newspapers are not essential to life! Good news came through the mail with results from the Great Taste Awards in the UK; and I was pipped to the post in blogging this news by Ivan McCutcheon on his blog Food Culture West Cork and he had a photo taken at the recent Taste of Cork Festival! I have just returned from a delivery to Scally’s Supervalu in Clonakility where I grabbed a copy of the current edition of the West Cork People, from Jean Farrelly, Joint Editor, as she was making a delivery there. Lo and behold we were on the front page! Jean told me that my Press Release arrived with her at 2.30pm yesterday and the edition was scheduled for printing at 3.00pm! I think this is the first time that Ummera has been responsible for “Stop the Press”! The actual Press Release can be downloaded as a pdf file here. I almost forgot what the Awards were for! Ummera Smoked Chicken and Ummera Organic Gravadlax. This now means that all our products have received awards at the Great Taste Awards over the last three years! To celebrate National Organic Week, The Irish Sunday Tribune Magazine published last Sunday, October 21st, an A-Z of Eco Chic, edited by Jillian Bolger and Claire O’Mahony. Deighted to see that Ummera is included in the list of 26 of “all things cool and organic”! But then what else begins with “U”!